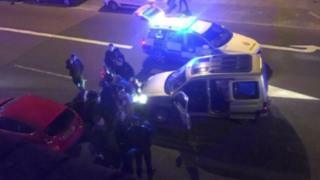 Three people were taken to hospital after a car ploughed into a large group of people outside a north London pub. Witnesses reported bodies being thrown "in the air" when the car mounted the pavement outside the Old Queen's Head in Islington on Saturday night. Two knives were found at the scene but police said they are not treating the crash as terrorist-related. Five men have been arrested. None of those hurt are thought to have life-threatening injuries. Cassandra Pessaran told the BBC there were "30-odd" people standing outside the pub in Essex Road just before 23:00 BST. She said she heard "screeching tyres" then saw a vehicle "playing bumper cars with about three other cars... before going straight into a crowd of people". Aris Papachronopoulos said he "saw three people in the air" after the car drove "into the whole group". Two men and a woman are being treated in hospital. Four of the arrested men, who remain in custody, were held are aged between 17 and 19. They were detained on suspicion of a variety of offences including GBH with intent and possession of points and blades, the Met said. One knife was found in the car while another was discovered nearby. A fifth man was arrested on Sunday afternoon on suspicion of involvement in the incident. he is also in custody. Islington South and Finsbury MP Emily Thornberry called the crash a "really horrible and frightening incident". But she said it was important that people "keep calm... and must not panic" as police had said "it does not look like a terrorist incident".